The leadership category examines how your organization’s senior leaders personal action guide and sustain your organization. Also examined are your organization’s governance system and how your organization fulfills its legal, ethical and societal responsibilities and support its key communities. The strategic planning category examines how your organization develops strategic objectives and action plans. Also examined are how your chosen strategic objectives and action plans are implemented and changed if circumstances require and how progress is measured. The customer focus category examines how your organization engages its customers for long-term marketplace success. This engagement strategy includes how your organization listens to the voice of its customers, builds customer relationships, and uses customer information to improve and identify opportunities for innovation. The measurement, analysis and knowledge management category examines how your organization selects, gathers, analyzes, manages and improves its data, information and knowledge assets and how it manages its information technology. The category also examines how your organization reviews and uses reviews to improve its performance. The workforce focus category examines your ability to assess workforce capability and capacity needs and build a workforce environment conducive to high performance. The category also examines how your organization engages, manages, and develops your workforce to utilize its full potential in alignment with your organization's overall mission, strategy, and action plans. 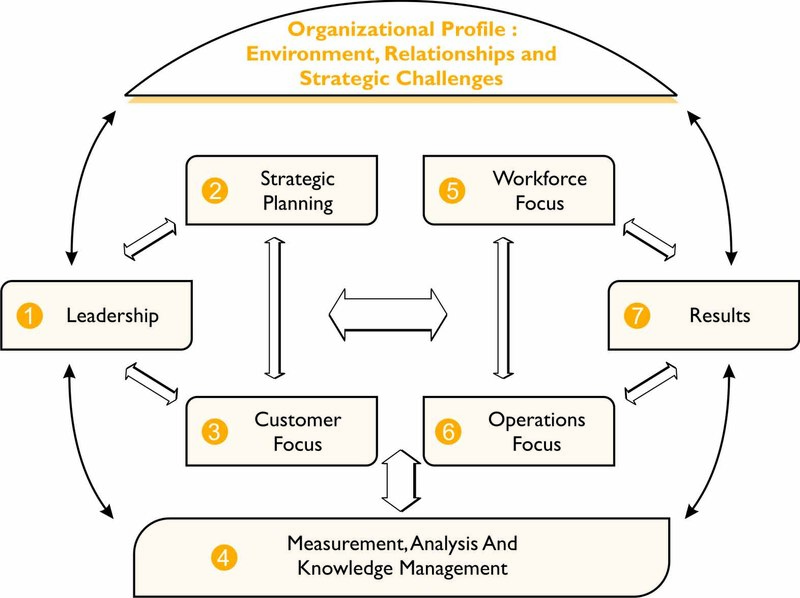 The operations focus category examines how your organization designs, manages, and improves its work systems and work processes to deliver customer value and achieve organizational success and sustainability. Also examined is your readiness for emergencies. The results category examines your organization's performance and improvement in all key areas—product and process outcomes, customer-focused outcomes, workforce-focused outcomes, leadership and governance outcomes, and financial and market outcomes. 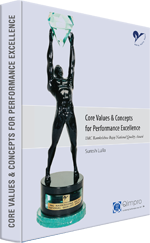 Performance levels are examined relative to those of competitors and other organizations with similar product offerings.